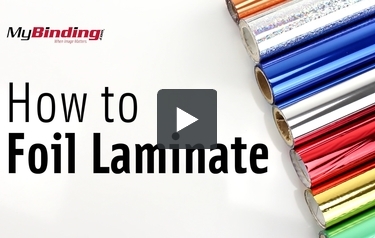 Find the right size laminating foil for your project. With these practical and easy to use hot stamp foils you can make business cards, book covers, invitations, letterheads, or packaging truly stand out! Discover a dazzling array of vibrant colors, sizes, and finishes. Welcome to MyBinding video. One of the coolest and most impressive effects in pouch laminating is foil lamination. Not only does MyBinding sell a number of laminators that can do foil lamination, we also sell all the supplies that you’ll need. You can take a standard laser jet printout or logo, choose from the many colors and styles that we provide and turn it into a piece of art. For crafters, artists or printers, anybody who needs to do a special effect, foil lamination could be key. Our dedicated staff is here to answer your questions and provide you with exactly what you need. Many of these foil laminating supplies and colors can be used with stencils and embossing, again, transforming standard covers and documents into something special. When it comes to the machines and supplies of foil lamination, we are committed to being your best source. When image matters, MyBinding.